‘I am hearing only the word uniform, uniformity. But this call is not Vedic or Hindu. It should be UNITY. two different things, measuring in two different circles. ‘This Nirayana system has produced chaos. that produces such confusion cannot be the right one. The true system produces order and unity, never chaos’. Thea (PNB) during the debates. The recently concluded Samelan at the abode of Sri Venkateshwara in sacred Tirumala reached certain conclusions by decision of the organisers. Going by the resolutions passed and the press reports the next day, it would appear that there was ‘unanimity’ among the attendees. Actually the truth is quite another. While it was true, as the Chairman remarked in his closing comments, that there were no fights and shouts and walkouts during the conference, and peace can be said to have prevailed throughout – in my view that peace was more like sleep. What was obvious to many is that there was an agenda set in place beforehand; and some delegates told me, when I asked what resolutions they thought would be passed, that the resolutions were ‘already decided’. That is, they were not to be the result of the debates and the points raised by the distinguished speakers, who were imminent astrologers, astronomers and scholars. They seemed rather to have come out of a void. The deciding body consisted of noted Sancharacharyas and Swamis, heads of various prominent Mutts. They presided. They decided. But in my view the result was as discouraging as it was revealing. The only ‘resolution’ arrived at was to maintain the current Nirayana Panchanga (ephemeris) system intact but to eliminate what I call the Ayanamsha Chaos. They resolved that ‘scientists’ would determine the correct Ayanamsha and a core committee would be constituted to ensure that this was followed throughout India by all. Thus, the desired uniformity would ensue so that the ever-louder complaints of the Hindu Samaj concerning the discrepancies in temple and festival timings, due to the many Nirayana Panchangas in use, would be eliminated once and for all. 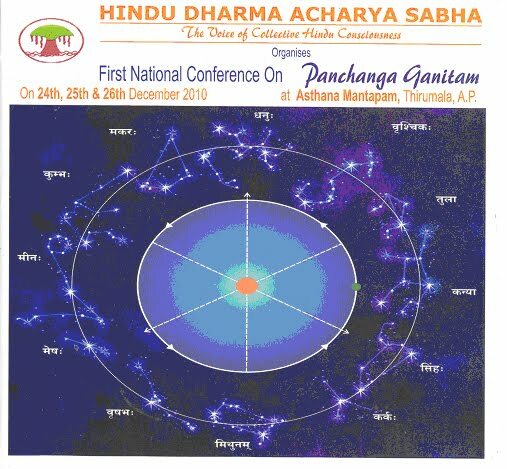 Further, they resolved that the Union Government should issue a national Panchanga based on this ‘correct’ ayanamsha that the astronomers were requested to discover. This entire conference, that could and should have been unique in the history of Hinduism, revealed itself to be just a non-starter. There was no real concern about the root of the Ayanamsha Chaos, nor how it should be solved on the basis of the true cosmology that we find in the sacred Tradition. There was no effort made to understand that ‘uniformity’ would never come about in temple timings and horoscopy because of the vested interests of each Nirayana almanac publisher. One told me that his family had been publishing their almanacs in Tamil Nadu for 120 years and that it was the most widely circulated. Similarly, there were a dozen or more publishers, each with their own ayanamsha based on their ‘unique’ and ‘correct’ calculations. Most considered that the quantity of correct predictions based on the respective almanacs entitled theirs to be selected for the national ephemeris. Mention of Tamil Nadu brings to mind a puzzling concern, for me at least. The conference was supremely well organised, the amenities and care of the delegates’ every need was superb and well appreciated. Everything was done to see that the delegates could concentrate with undivided attention on the issues and not be bothered by material concerns. Included in this and for the benefit of speakers and attendees, numbering close to 150, simultaneous translators were on hand. There was a translator for English, Hindi, Telegu, Kannada and Sanskrit. Being from Tamil Nadu, my attention was immediately drawn to the fact that there was no Tamil translation available. This was strange. It was made obvious when at the time of the inaugural addresses Sancharacharya Sri Jayendra Saraswati of Kanchipuram had to speak. His first comment referred precisely to what I had noted, that he would have to do so in Tamil without the benefit of a translation. This bizarre situation alerted me from the very first day that something strange was afoot. Of course it could not have been an oversight in such a carefully arranged gathering. Was it deliberate? Could it possibly have been a tactic to oblige the Tamil contingent to speak in Sanskrit? If so, why? This raised a series of questions in my mind. Residing in the Tamil country for 39 years, I have long known of the dispute between Sanskritists and Tamil Scholars regarding the fact that both are equally ancient – and sacred, in my view. I have been aware of the rejection by contemporary Tamil scholarship of the Rig Veda, for example, because it is considered to be an historic document describing the Aryan invasion and conquest of the Dravidian land and the subjugation of its people by the ‘invading Aryans’ from the north. Sanskrit is considered by Tamil nationalists to be a northern imposition because the language of the Rig Veda is Sanskrit. Therefore, if indeed there was an ulterior motive to oblige Tamil speakers to use Sanskrit, which of course they could easily have done, bespeaks a certain arrogance; that is, assuming the intention was to oblige Tamils to fall in line. And it seems inconsiderate of the sensitivities of those of us who had come from Tamil Nadu to this landmark conference. Indeed, a shadow would cover the Light. There would be interference in its transmission, exactly as seen in the sky at that most fateful eclipse. The astronomers present at the gathering constantly demanded that accuracy would come about (only) by mathematics coupled with physical observation. But, if one does not understand true astrology, one observes but DOES NOT SEE. Thus, not one was alerted, though eclipses are supposed to be important in astrology. However, unknowingly I did throw the event out into the open when I innocently made an announcement to the delegates: Sixty temples in Tamil Nadu have just celebrated Makar Sankranti together with the Solstice in Tamil Nadu. I do not agree with the general interpretation of the Rig Veda as an historic document of the early struggles between peoples of the subcontinent. I know this not through Sanskrit but as a practitioner of a process the Rig Veda describes very minutely, which reveals it to be a sublime collection of praises extolling a secret initiatic doctrine. It has nothing at all to do with Aryan versus Dravidian. I am not at all stating that conflicts and conquests did not occur, only that this is not the content of the Rig Veda. But who can understand the Rig Veda? The Sanskritists who spend a lifetime pouring over the hymns know very little of its rahasya, the most supreme Mystery of all. And it is universal, eternal, not reserved for one ethnic group or country or even only for one conversant in its language. The paper I presented at the conference makes the point abundantly clear. Thus, this masterful collection has become one more tool to divide-and-rule, just like the Nirayana calendar does: it divides and can never unite. More importantly, the Rig Veda holds the answer to the current calendar conundrum. By following its precise precepts the correct method for time reckoning could immediately be established. And this would satisfy both sides of the divide because it was the calendar used in both the Vedic and Sangam eras. This would instantly allow for a certain integration to come about. And it would be UNITY, not mere uniformity which can never resolve the issues at hand. Furthermore, there would be absolutely no need of ‘corrections’. There is only one ayanamsha in the ancient system – but of course this would sit wrongly with vested interests. I was the only white person attending and the only woman delegate. This had its pros and cons. It was positive in that it drew the curiosity of some of the members who did listen carefully to my reading. But to be honest and assessing the entire unfolding by hindsight, it was a miracle that I had been invited at all to what I realised was a tightly knit community of Sanskritists who would not care to listen to any contrary argument, much less from a woman. Indeed, my gender did produce complications, such as that I could not be seated next to the Sancharacharya chairman on the dais because ‘you are a woman’, it was apologetically and politely explained to me. This was not an issue for me and I promptly obliged by changing my seat away from the holy man. Similarly, when shawls were handed to each speaker by the Sancharacharya, mine was given to me and not placed on my shoulders, as for all the others. This too did not bother me, nor did I seek to visit the temple, knowing that foreigners are not allowed. I respect tradition in these sensitive matters, though I may not always agree. All the other speakers took at least 30 minutes, some even far more. Why only 10 for me? If this had been only my fate I would have attributed it to my gender, but as I later learned the panchanga publisher of a similar school as mine, Lokesh Darshaney, had also been given only 10 minutes.4 Bold as I am, I pressed on and spoke for perhaps 20 before I was halted, but not before my point had been made. Happily, it brought the assembly alive and thereafter the real issue took centre stage and intense exchanges followed. What I learned was that this contrary voice was sought to be silenced. Indeed, no mention was made of these contrary views in the resolutions; it was as if they did not exist. In fact, though I repeatedly challenged the astronomers present, who I consider to be misleading the public and for which I provided sound cosmological proof, NOT ONE RESPONDED to prove scientifically, according to the science they have imposed, any inaccuracy. For the truth be told, they would have been committing the sin of Defending the Indefensible. Since this is the indefensible foundation on which the ‘scientifically accurate’ Nirayana Panchangas are based, of course I had to be silenced. Immediately after my interrupted reading, the next speaker stepped on to the podium. I am told by various listeners that his very first words were: This is science, not Veda. Well, this is the crux of the problem as I presented it: science not veda. That he felt comfortable making this statement in reply to my argument, and that too before the august assembly of holy men, indicates better than any argument I could make just how far the Dharma has been corroded, just how much disintegration has taken place. I have only a few words to say as this august gathering is brought to a close. My intention was to read the last part of my paper with its visual aids. But now I realise that to do so would be simply self-gratification and indulgence. It pleases me to sing the harmonies. It is what I was born to do, and indeed it is so very pleasing to sing praises to the Mother through her universal harmonies. Those praises, which should be the aim of every astrologer, are found, experienced, lived when one rises above Mind, when one enters the Divine Consciousness. The deliberations I have been listening to of the learned men, particularly the learned astronomers, have not arisen in the higher consciousness. They are only from the realm of Mind, and when one is trapped in the realm of Mind, there is, in the best of cases, compromise or consensus until some form of resolution is hammered out. But that will not solve the most important issue ever to face the true Vedic/Sangam tradition. Astronomy is right when it abides in its rightful place. It is not right when it seeks to decide matters above Mind because solutions can come in this essential calendar matter only when we break free from the mental cage and soar above in the higher realms of consciousness. There one finds no mental formulas, no compromises, and certainly no chaos, as is now the case. The Nirayana System, born of Mind, has produced what the mental consciousness can only produce when pressured: chaos. To know what the Rishis knew we must find that higher consciousness which lies beyond the reach of the astronomers here, and throughout the world. The right calendar for the Hindu Samaj exists, it is, it is eternal, even as the Dharma is eternal. But to reach that luminous kingdom of the Sun we must turn to the Sun, our luminary. There we find the answer – in the solar regions. There the Calendar of Unity exists eternally. All we have to do is to turn to the Sun of our solar system and refuse to lose ourselves in the Beyond, as the Nirayana system forces us to do. In our Sun lies the answer – and it is the solar calendar that unifies and never gives rise to the Ayanamsha Chaos of today. I beg of you, rise to the occasion for the sake of the Santana Dharma, rise above Mind to the solar world, to Swar. 1 While deliberations were on to hammer out the final resolutions, an attendee reported to me that he overheard someone in the group exclaim, ‘And don’t let that lady speak!’ He was amused. 3 Given the unfolding of events, I doubt this will happen. Therefore, those interested will find my full paper at the end of this report, and also on our blog: www.puraniccosmologyupdated.com. At the concluding session certificates were given to the participants. Where it was printed after the scholars name, ‘presented a research paper on’, those words had been crossed out in mine. I was acknowledged as present only. The above is the cover of a brochure distributed by the organisers to all the delegates. In this one diagram we see the entire problem encapsulated – particularly when we compare it to the similar diagram in the last part of my paper (which I was not allowed to read). However, the difference between the two is striking. In mine (page 8) the centre is FULL. 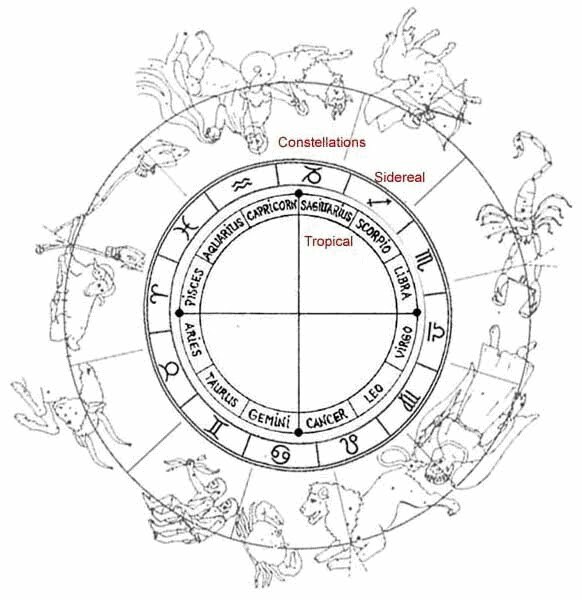 We see the Tropical Zodiac, exactly where it belongs – central – the same as in the Sangam and Vedic Ages; filling the void, so to speak. It is the void displayed in the above that tells us everything we need to know. This is the graphic that explains the ‘scientific imposition’ on the Dharma: THE CENTRE IS EMPTY. It is the very same imposition which allowed for colonial powers to subjugate and humiliate this sacred Bhoomi. Science, as the organisers’ diagram reveals, pushed what we find in my diagram out from its rightful place and into the constellations, a fact for which not one of the astronomers present at the conference had any explanation. This is clearly demonstrated in a comparative study of the two: the Tropical Zodiac has been thrust out into the Beyond; their 12 names (Sanskrit) have been entered outside and around the constellations. With this one act all legitimacy of the Earth’s own measure as a result of her rotation around the Sun has been swept away, pushed out into far distant space where it does not belong, bearing no relevance to our temple matters and individual horoscopes. The error, grave indeed, is even demonstrated by the fact that the inner circle of the organiser’s graphic is not the natural fourfold division we find in mine. It is gone, the zodiac is gone, bereft of the Equinoxes and Solstices – and so is all the higher knowledge. When Knowledge is absent superstition emerges. Ironically, science is supposed to save Hindus from the bane of superstition. Instead, as these comparative diagrams explicitly reveal, it is SCIENCE that is solely responsible for inculcating superstition: the centre is a VOID, and in that void superstition inevitably arises. Or, as one delegate at the conference intrepidly quoted from the 1953 Calendar Reform deliberations: ‘You believe you are guiding Hindus to Dharma. Instead you are carrying them to adharma.’ This quote was repeated two times during the conference; no notice was taken. Not one of the illustrious scientists present paid any heed, so confident of the hold they have because of the predominance of philosophies and yogic systems founded on the experience of maya and the void. In that Void what would be the purpose of correct timings? It is all ‘illusion’ they say, time and space as well. The Vedic Divine Maya has been stripped of her sacred grandeur and her contribution as the formative consciousness of the Absolute, and in their experience she is only Maya, illusion. These beliefs took hold during the Age of Enlightenment and the British Raj. What better, more thorough way to subjugate Hindus than this, and to undermine the Dharma? Science and ‘enlightenment’ would save the day! And thus was seeded the Ayanamsha Chaos that continues to plague Hinduism through the Nirayana Tyranny. Nice post !! Great idea, people have faced astro problem many times in life. They can get good result by help of astrologer.